UPDATED: I revisited my Go Pack in summer 2015; you can see that updated post here. I’m an inherently nervous traveler. I don’t do well with air travel in particular, though as I’ve gotten older I’ve relaxed quite a bit. Nevertheless, some small affordances and planning made now can make for a much better trip tomorrow. For some it’s fussy coffee. 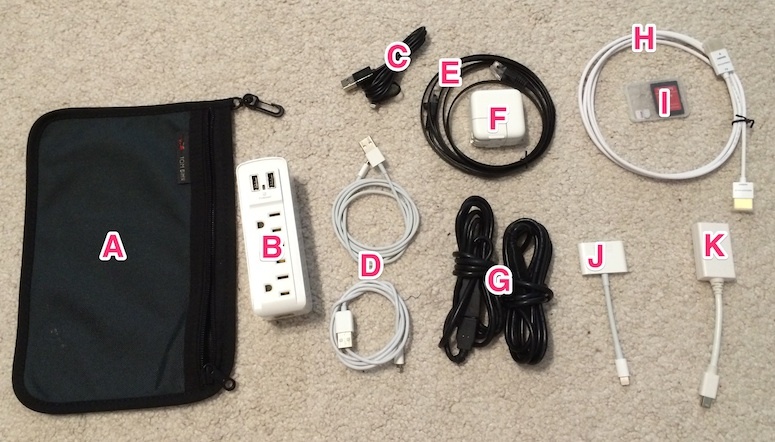 For me, it’s my “go pack” of cables and adapters, ready to go at a moment’s notice. I’ll go through each item. Prices and links will be as they are today; I’m making no guarantee the prices will be the same nor that the links will stay functional forever. This is the pouch that all of the other items pictured live in, with the exception of the next item. I have an unhealthy obsession with laptop and iPad bags; Tom Bihn is quickly becoming one of my favorite brands. Sturdy, functional, well designed. This power strip I picked up around five years ago from Best Buy. It isn’t available anymore, though this Belkin is the closest equivalent. What I love about this Dynex is that it will charge both our iPhones, as well as have three other plugs for charging computers/iPads/etc. But perhaps most importantly, it works with 220V electrical systems (unlike the Belkin), which makes it wonderful to use overseas. I also carry two standard USB to Lightning cables. One of those pictured is Monoprice and one is Apple, but if I were to buy two new ones, I’d just get the Monoprice ones. They’re sturdy, but the Lightning side is also thin enough to fit in most standard cases. I’ve had far worse luck with the Amazon equivalents. A standard iPad charger. I bring this with me in part because we occasionally have three devices charging simultaneously, but also because the Dynex strip doesn’t output enough wattage over the built-in USB ports. Having a couple of these around makes charging phones at night way nicer. Since the Dynex power strip is likely near one side of the bed, these two extensions hooked together provide for an extra 12’ of slack on the standard charge cable. This way both Erin and I can have our phones on our respective bedside tables. UPDATED 2014-09-03 8:00 AM: I’ve found that since hotel power outlets are often nowhere near the bed, I like to have an extension for my phone as well. Thus, though it’s not pictured, I’m actually carrying three of the extensions. Earlier I mentioned the HDMI cable, so what video/audio am I running through it? This (really expensive) adapter allows me to connect my iPhone or iPad to the TV in the room to play whatever I want. I’ve used it to play media on the device, Netflix, my Slingbox, etc. If I happen to have my Mac with me, I may want to use it as the media source for the TV. This is especially true if I can connect via Ethernet. Thus, I bring an adapter to get the Mac to output via HDMI as well. As you can see, there isn’t very much to this bag, but knowing it’s always ready to go brings me tremendous peace of mind. I don’t need to worry about rounding up cables from our bedroom, or our cars, just so we can travel. The go pack is ready to go, waiting for us to go on a trip. The total cost for all of the above is around $150. That’s quite a lot, but I’ve been building the pack and spreading the cost over a couple years. Additionally, the expensive Digital AV adapter alone is roughly one third of that cost. To me it’s worth it. Anything to make travel a little bit easier. UPDATED 2015-09-13 2:30 PM: Included a link to the updated edition.